This paper describes a hybrid approach, using bibliometrics and text-mining, used to analyze longitudinal trends in the literature of e-marketing research from 2001 to 2010. The abstracts of 888 articles from six leading marketing journals were analyzed. 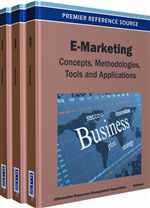 The analysis identifies several core topics and themes of e-marketing research and reveals trends occurring in this growing area. The study reveals that combing bibliometrics with text-mining is a useful way to identify themes and trends for a topic in the literature and can produce meaningful results to help researchers achieve a deeper understanding of an area of interest. Over the past decades, extensive research has been conducted on e-commerce. E-Commerce is a term used to describe trade that takes place over the Internet (Mahadevan, 2000). It also describes the way in which transactions take place over telecommunication networks (Ma, 2010). The practice of conducting business over the Internet was seen in the early 1990's as a revolutionary way to conduct business because the buyer and seller never had personal contact. E-commerce is an expansive subject that covers the entire purchasing process, from information search to follow-up product support. Because of limited resources and time, the authors of this study focused on the marketing aspects of e-commerce, i.e., e-marketing which is the marketing (generally promotion) of products or services over the Internet. E-marketing is also known by a number of names such as online marketing, interactive marketing, and web analytics. E-marketing offers advantages such as reduced costs and a wider reach to customers (Sheth & Sharma, 2005). A preliminary review of the literature indicates that e-marketing publications often explore or discuss which marketing strategies and techniques are effective and which ones are not for promoting products or services over the Internet, and they offer various e-marketing opportunities and issues in different contexts (Ngai, 2003; Schibrowsky, Peltier, & Nill,2007; Sheth & Sharma, 2005).